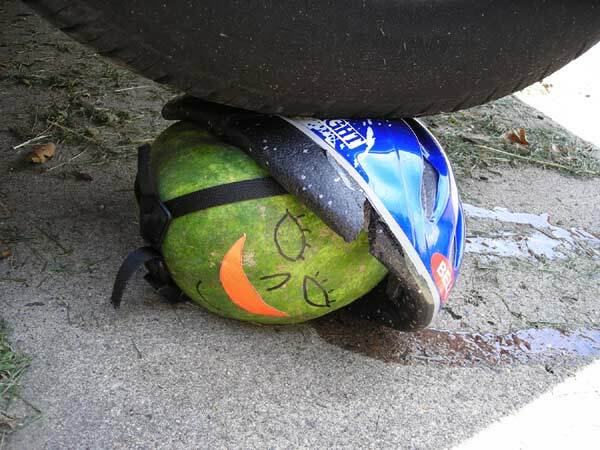 Summary: We tried lowering a car wheel onto two helmets with solid watermelons inside. 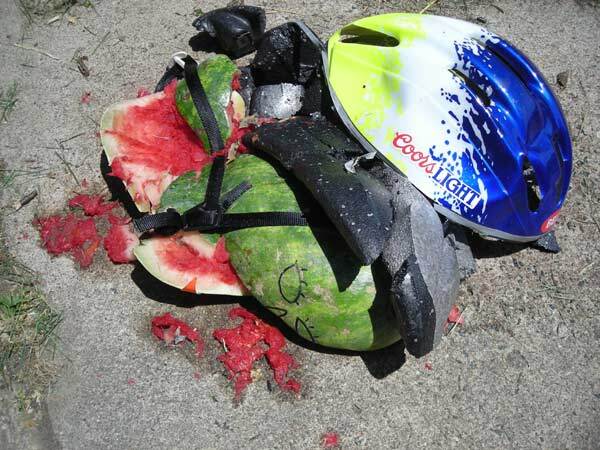 The result in each case was a smushed helmet and watermelon. Here is our first victim. Placed under the wheel of a Toyota Sienna minivan. 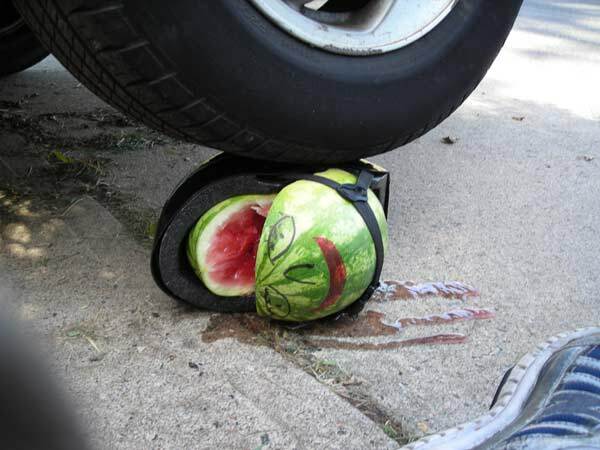 and juice began to flow out of the melon. When the full weight of the wheel came down, smush! When we backed up, the movement of the wheel finished the job. The thin PET shell remained intact, so we moved it to show the destruction. But what about a hard shell? helmet certified to the CPSC bicycle helmet standard. It had an ABS shell stiff enough to be difficult to flex inward. 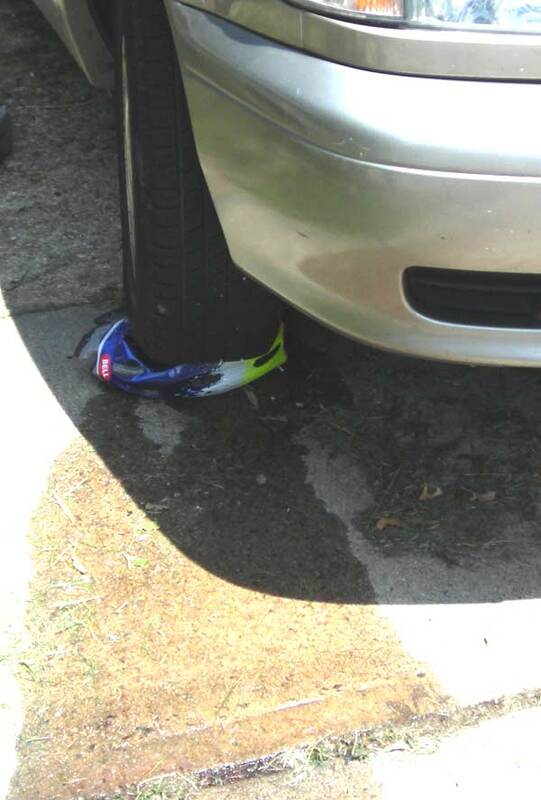 Placed under the wheel of the minivan. 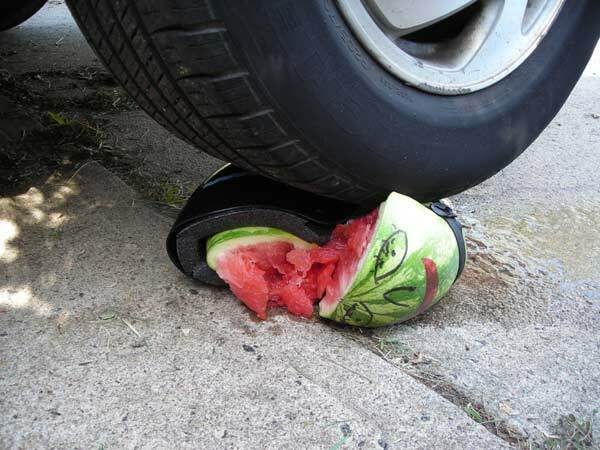 flexed and gave way, splitting the melon. juices flowed away into the gutter. Again as the full weight of the wheel came down, smush! 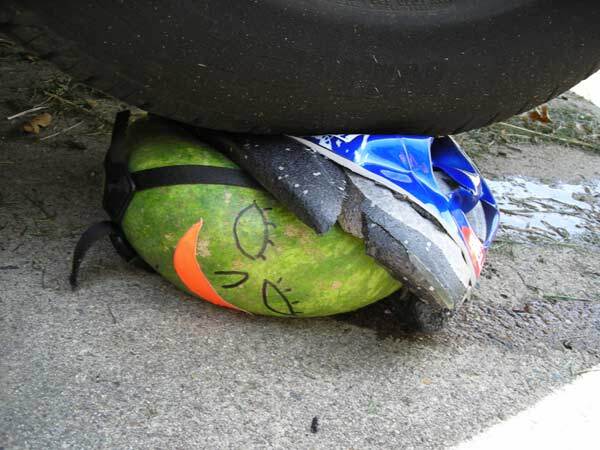 When we backed up, the melon was clearly dead. The inside looked pretty bad. The shell had cracked in multiple places. 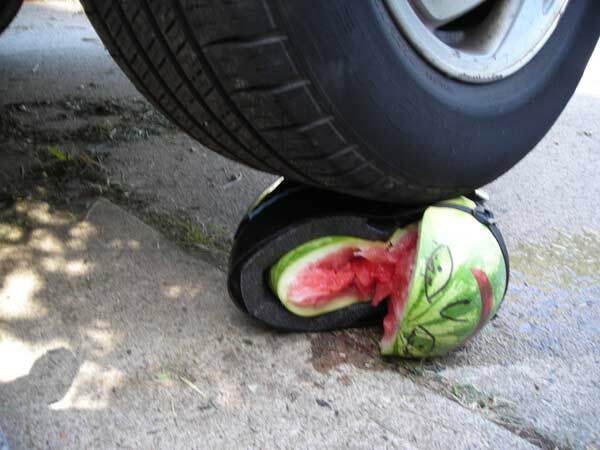 test to certify the melon's soundness. Careful examination of the melon after the preconditioning stand revealed no cracks or other damage to the exterior, and no indication of mushy spots or other damage from the weight of the tester. 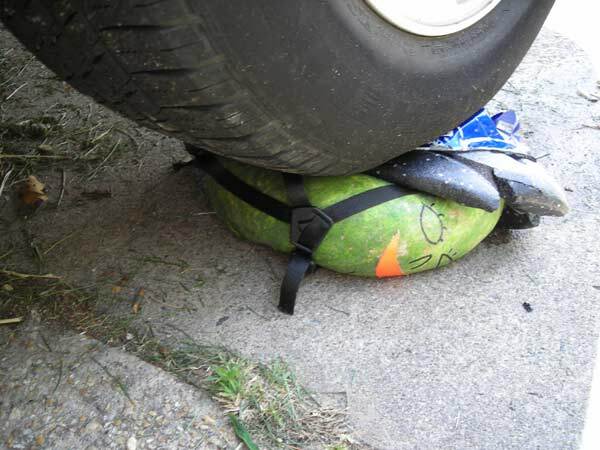 Full disclosure: innocent watermelons were smushed in this test. There was not enough left for a snack. This was a static test. 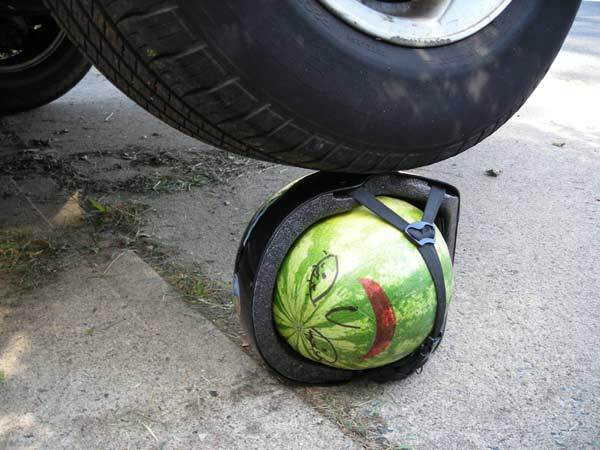 A more relistic test would be to drive the car over the helmet at 25 mph. 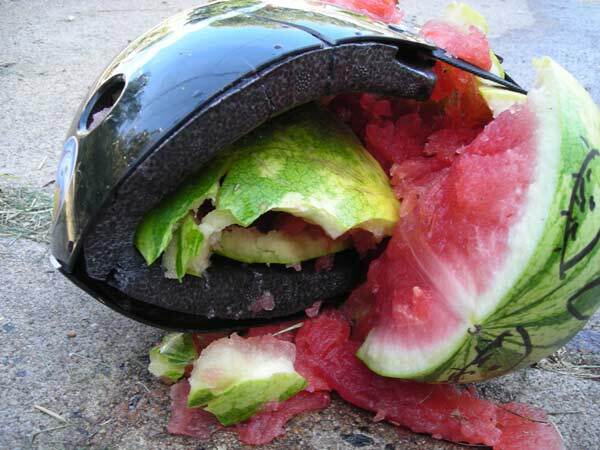 But it would be difficult to prevent the helmet from "squirting" out from under the wheel. Anybody want to try it? 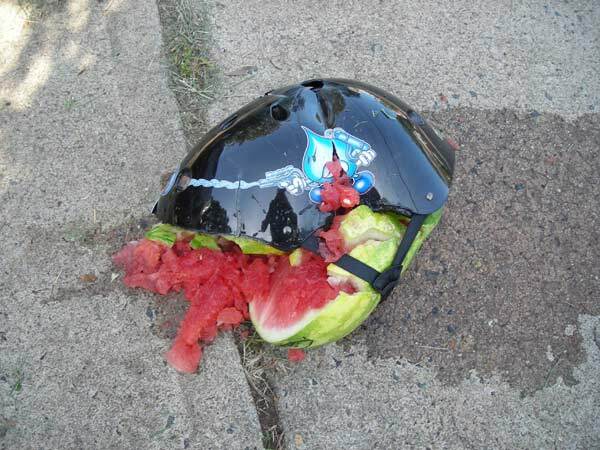 Dave Thom of Collision and Injury Dynamics informs us that he knows of cases of "even bigger vehicles running over heads in bike helmets and they look remarkably similar to your melons." Kids! Don't try this at home! We at the Bicycle Helmet Safety Institute are professional smushers and we are licensed to have a lot more fun than you have. Besides, our tester developed a blister from cranking the jack up and down, and the car might fall on you if you are not careful. This test was conducted on June 22, 2007. 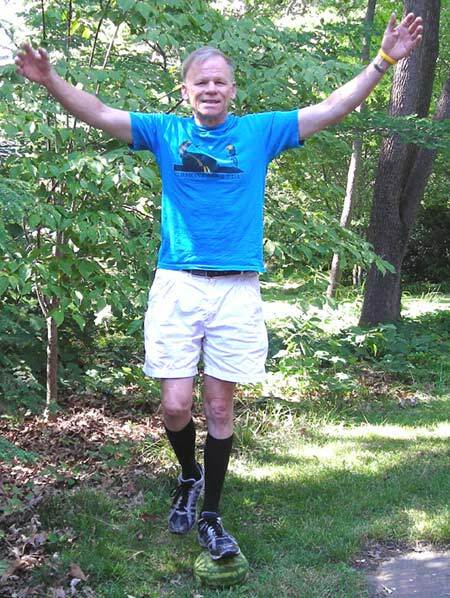 Conditions: sunny and fair weather, low humidity. 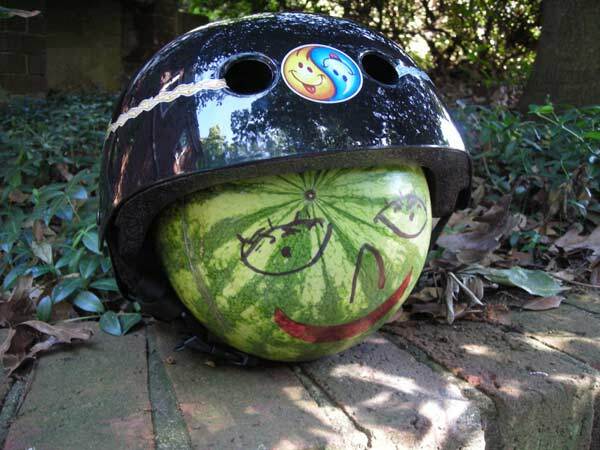 Watermelons were firm enough to stand on prior to the test and fitted as well as possible to the helmets. 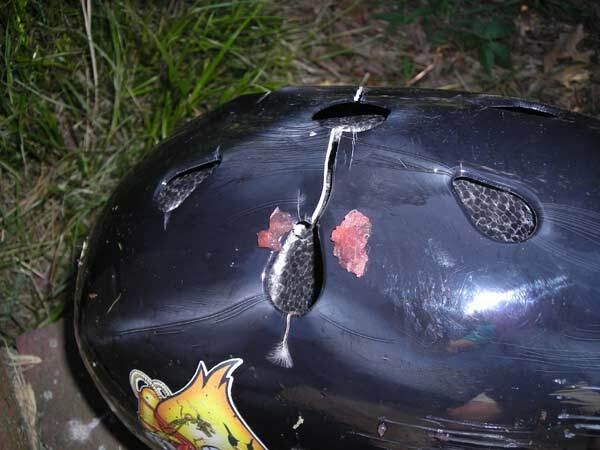 The thin shell helmet was one we had lying around, and probably about typical of the impact protection available in a current CPSC helmet. 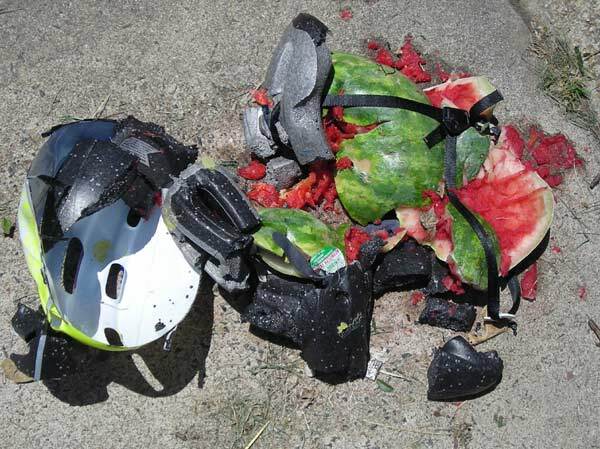 The hard shell helmet was purchased new for this test and was also CPSC-certified by the manufacturer.